Celebrate St. Patrick’s Day (March 17th) by eating green—no food coloring necessary! This year, you don’t have to eat corned beef and cabbage to bring out the Irish in you. Everyone can stay healthy with these fresh green appetizers from Del Monte and Starkist that’ll make you the hit of the party. Check out the recipes below to find out how you can get 130% of your Vitamin C in one festive serving! 1. Drain spinach well reserving 2 tablespoons liquid. Chop spinach (if using Whole Leaf Spinach). 2. Combine reserved liquid, sour cream, mayonnaise and soup mix. Stir in spinach and red pepper. 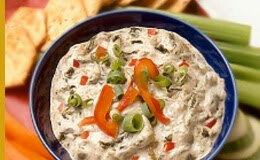 A flavorful twist to one of your favorite appetizers! · Preheat oven to 375°F. · Mix artichokes, mayonnaise, sour cream, Dijon mustard and hot sauce in a medium bowl until well blended. · Add tuna, spinach and cheese. Mix until well blended. 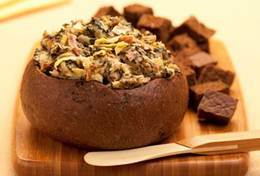 · Place in small casserole dish (2 cup size) and bake in preheated oven for 20 minutes. · Serve in dish or in hollowed out bread bowl.